To support you in your efforts to create safer streets in your neighbourhood, we have collected research and data from around the world about the best safety practices. Encouraging walking and biking for transportation is one important way to address the low levels of physical activity among Canadaʼs youth. There is a strong association between active travel to school and levels of physical activity (1). Improving conditions for walking and biking can have a positive impact on local economies and equity (2). Traffic calming and reduced traffic speed can attract customers and new businesses to an area. These improvements to the pedestrian environment result in better retail sales and make neighbourhoods more desirable places to live (3). Studies from around the world have taken a closer look at the effectiveness of lower speed limits in residential areas and found them to be effective at lowering speeds and improving safety. In Switzerland there was a decrease in overall accidents (15%) and accident severity (27%) in 30km/h zones (4). In London (UK) a reduction of road casualties by 41.9% (48.5% among those 15 and younger) was reported for 20mph (32km/h) traffic speed zones compared to adjacent areas without lowered speed limits (5). Lancashire County (UK) implemented a blanket 30 km/h speed limit in all residential areas and near all schools, and early indications are that deaths and injuries have been reduced (6). One concern about lowering speed limits is that they may frustrate drivers and create a false sense of security. However, lower speed limits have proven to be particularly effective on local roads. Studies that have found that reducing a speed limit fails to reduce actual travel speed have mostly been limited to high-volume high-speed roads. Studies done in residential areas, however, have found statistically significant speed reductions were achieved when posted speed limits were reduced (7). Calgary found an average speed of 32 km/h in 30 km/h school zones, and an 85th percentile speed of 38.8 km/h. While 54% of vehicles drove at speeds higher than 30 km/h, only 10% drove at speeds more than 10 km/h over the speed limit (8). An analysis reviewing 33 previous studies found that area-wide traffic calming reduced the number of injury accidents by 15%. Residential areas saw an average reduction in the number of injuries by about 25% (9). Marked pedestrian crossings should be combined with other safety measures, such as signage, signals, raised medians, narrowed roadways, or other features (10). Without these other measures, studies have found no significant difference in safety between unmarked and marked crossing sites (11). Pedestrian controlled flashing or solid lights that signal drivers to stop have been shown to reduce crashes involving pedestrians by 69% (12). Raised medians have been found to reduce crashes involving pedestrians by 69%. Even at non-signalized intersections a raised median with a marked crosswalk can reduce collisions between vehicles and pedestrians by 46-56% (13). Installing roundabouts in place of conventional intersections, including both traffic lights and stop signs, is a very effective speed control measure, and can reduce collisions with pedestrians by 75% (14). 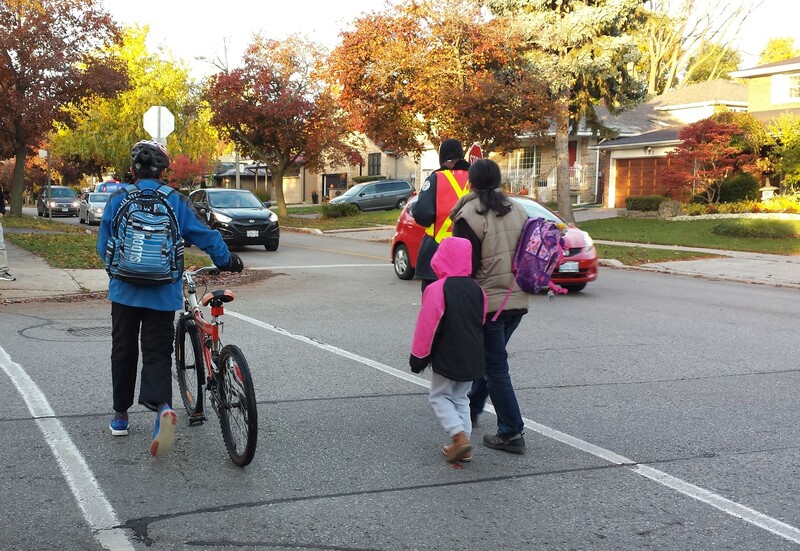 And for some additional local research, read Linda Rothman’s study on parents’ perceptions of school traffic safety: summary or full article. Garrard, J., Rissel, C., & Bauman, A. (2012). Health benefits of cycling. In Pucher J. & Buehler R. (Eds. ), City Cycling (pp. 31-54). The MIT Press. McDonald, N.C. (2012). Children and cycling. In Pucher J. & Buehler R. (Eds. ), City Cycling (pp. 235-256). The MIT Press. Lindenmann, H. P. (2005). The effects on road safety of 30 kilometer-per-hour zone signposting in residential districts. Institute of Transportation Engineers. ITE Journal, 75(6), 50-54. Grundy, C., Steinbach, R., Edwards, P., Green, J., Armstrong, B., & Wilkinson, P. (2009). Effect of 20 mph traffic speed zones on road injuries in London, 1986-2006: controlled interrupted time series analysis. Bmj, 339. Rossy, G. M., Sun, C. C., Jessen, D., & Newman, E. (2012). Residential Speed Limit Reduction Case Studies. Open Transportation Journal, 6, 39-45. Kattan, L., Tay, R., & Acharjee, S. (2011). Managing speed at school and playground zones. Accident Analysis & Prevention, 43(5), 1887-1891. Elvik, R., (2001). Area-wide urban traffic calming schemes: a meta-analysis of safety effects. Accident Analysis & Prevention, 33(3), 327-336. Arason, N. (2014). No Accident: Eliminating Injury and Death on Canadian Roads. Wilfrid Laurier Univ. Press. Retting, R.A., Ferguson, S.A. & McCartt, A.T. (2003). A review of evidence-based traffic engineering measures designed to reduce pedestrian-motor vehicle crashes. American Journal of Public Health.